U.S. Politics Trump’s dream of a conservative Supreme Court is now within reach. Can the Democrats stop him? Trump’s dream of a conservative Supreme Court is now within reach. Can the Democrats stop him? Suddenly, this autumn’s vital U.S. mid-term congressional elections have become even more contested, even more contentious – and even more consequential. With Wednesday’s retirement of Supreme Court Associate Justice Anthony Kennedy, all the forces that congealed to produce the Donald Trump era in U.S. politics – and that Mr. Trump has weaponized in his 17 months in the White House – are colliding again with even greater significance. The Supreme Court is the cockpit of U.S. politics, the final arbiter of issues the political system has set in motion but cannot resolve, and Mr. Trump has been presented with the opportunity to upend the fragile balance of the high court. Supreme Court Associate Justice Anthony Kennedy in a 2015 file photo. 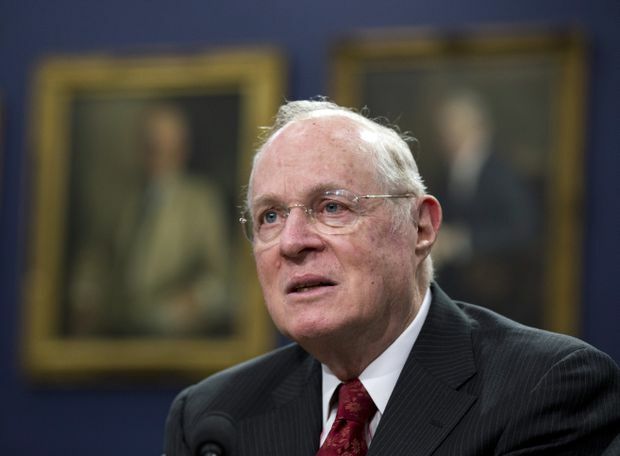 Justice Kennedy’s decision to retire at age 81 has produced a decisive moment in Washington, with a divided, do-nothing Congress now forced to deal with an issue that, more than individual votes on immigration, tariffs or health care – none of which it has been able to bring to completion – has the potential to shape the political and social character of the United States for decades, perhaps even for generations. The result will be a fall campaign full of drama and energy, intrigue and hyperbole, with parallel battles on the Senate floor, where lawmakers will come face to face with the consequences of the divisive choices they made in recent years. Even as Republican senators will work to confirm Mr. Trump’s second nomination to the U.S. high court, their Democratic rivals will be determined to put off the vote until after the new year. They hope November’s elections will topple the GOP majority and prevent Mr. Trump from putting his own nominee on the court to replace Mr. Kennedy, who for decades, has been regarded as a conservative who swings to the liberal side on social issues such as abortion and the death penalty. The Republicans will seek to hurry up, the Democrats to delay. But one other factor will be at play: The Republicans prevented the Senate from confirming Merrick Garland, former president Barack Obama’s selection to replace the conservative Antonio Scalia, arguing that the issue should be put off until after the 2016 election. They prevailed, but now face the certainty – set in motion by Senate Democratic leader Chuck Schumer of New York within hours of the Kennedy resignation – that the same argument will be mobilized against Mr. Trump’s selection. But until at least the first week of January, the Republicans will control the Senate, with majority leader Mitch McConnell of Kentucky controlling the flow of votes onto the chamber’s floor – and having more than six months to use his wiles, his experience, and his powers to force a vote. The Senate elections may be in the first week of November, but Mr. McConnell has the power to keep the Senate in session through the New Year if necessary. So Mr. Schumer, who possesses wiles of his own, will face the challenge of using the manifold delaying tactics embedded in Senate procedure and tradition. That might have been easier years ago, before a procedural change essentially rendered Supreme Court votes subject to a simple majority rather than 60-per-cent pluralities – a change pushed through by the very Mr. McConnell who is to be Mr. Schumer’s sparring partner on this issue. The clock now is running, and before the Trump nomination can come to a vote, the President must make his selection, and the nominee must go into relative isolation to prepare for searing Senate judiciary committee hearings, a forum known as ‘’murder boards.’’ This process customarily takes months, but none of the customs that have prevailed in Washington apply in this era – including the custom that, ordinarily, some members of the opposition party, citing the sterling qualifications of the nominee, vote for the President’s selection. That profile may not be entirely correct. Since 2006, Justice Kennedy repeatedly was the swing vote on issues such as gay rights and gay marriage, for example, but he also voted to expand the Second Amendment, involving gun rights, and the ability of corporations and special-interest groups to make independent expenditures in political campaigns. He also voted to strike down the Obama health-care plan.